Enter the new Time4Learning activity scheduler! When you log in to your parent account, you will notice a new icon at the bottom of the page. Click on the Activity Scheduler icon, and you will be offered a variety of ways to customize your PRINTABLE lesson schedule! The schedule includes places to check off each lesson as it's completed, as well as to indicate when your student has finished a worksheet. Far from being a rigid dictator, the new activity scheduler will include the date range YOU indicate, and the subjects you request. You can further customize your schedule by opting to include or ignore certain activity types, such as worksheets or tests. The schedule generated will suggest activities to be completed each week. Use it to check off activities as your student finishes them, and to jot down notes and reminders about your child's progress. If your plans change, simply generate another schedule with the altered information! Feel free to try out several scenarios and print the one that seems to best fit your student's situation. Printed schedules are an attractive addition to a homeschool portfolio, or just a great way for families to readily view what has been accomplished, and what is still to be done. Use information found in the Time4Learning Lesson Plans/Scope and Sequence to easily generate a schedule for each of your children. Students working from a schedule may find it convenient to utilize the Activity Finder, located on their lesson launchpad. 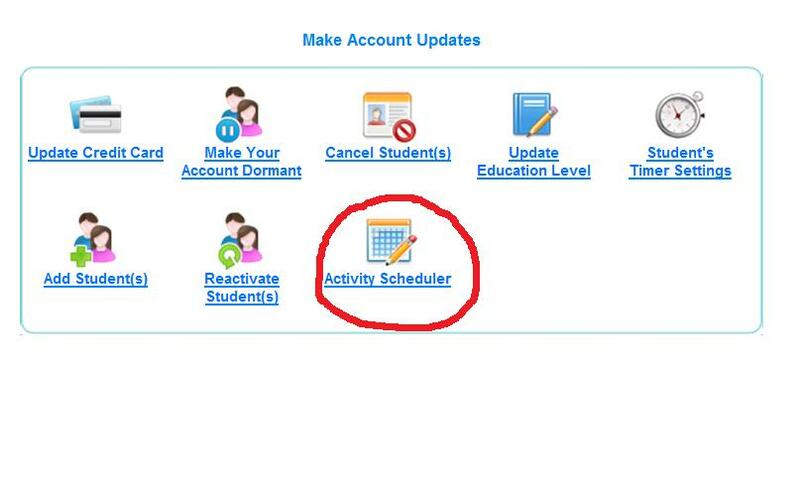 Have you used the new Activity Scheduler? Please leave your comments, suggestions, or questions, below. I tried it out today. So glad to finally have this feature available! I love this new feature, though think it would be easier of the Test activity numbers and quiz activity numbers were included in the lists. If I want my child to do the quiz I have to schedule him one lesson out in order for it to show up on my list. Other than that we will use it from here on out. It keeps them and me on track!!!!! I love that there is a printable activity calendar. It would be so lovely if you could enter batch (many at once) codes for all activity into the launch pad for kids. When the program starts those are the activities that are generated for the student. Or better yet when you pick the activities in the Activity Scheduler, the classes are automatically put into the launch pad. I have not started using Time4Learning, but in "playing" with it, I ran across a screen that says you have no scheduled activities. I thought it was related to the activity scheduler, but when I printed out my schedule, it still says you have not scheduled activities. How can you add assignments?